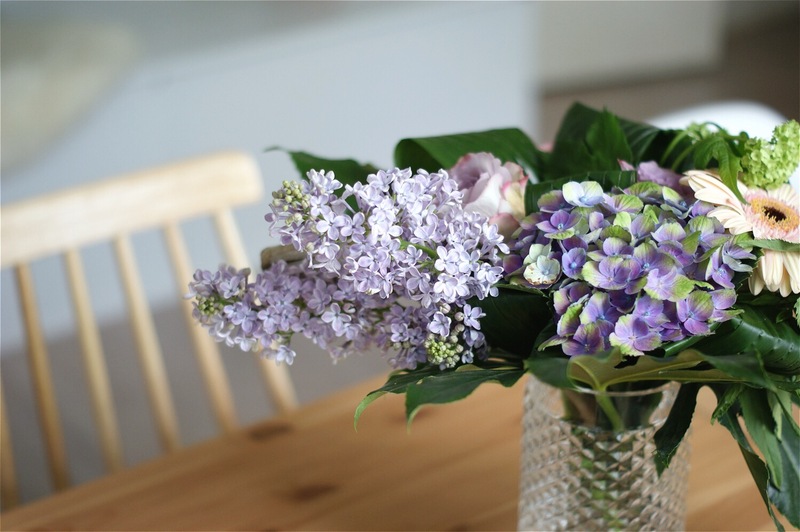 Week 19: it was a calm week in which we celebrated my sister’s birthday and also mother’s day. There were long days filled with work as there is still so much work left to do before we go on holiday. I noticed that I have to make sure to take a little break every hour/two hours as I tend to forget when I’m really busy. I mostly enjoyed the quieter moments this week. 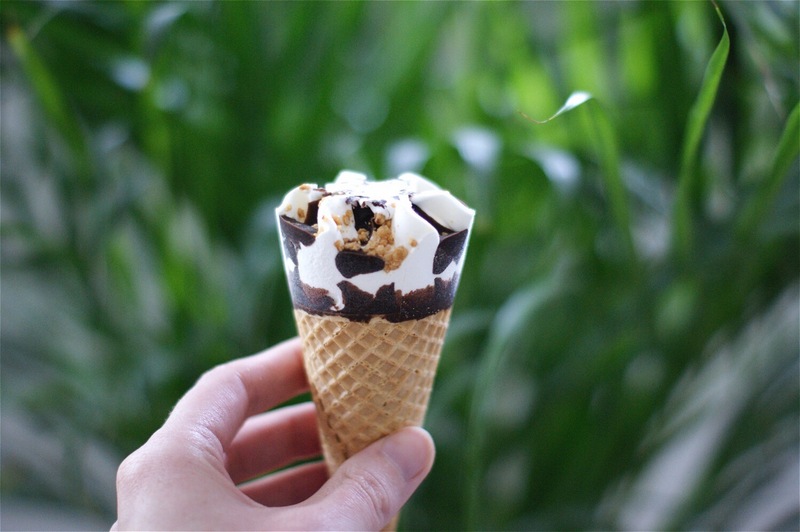 Having a relaxed breakfast together with Rene, having a box of ice cream in the freezer for the first time this year and I love working at the table, especially since the tree outside our window is beautifully green again. Week 18: the most boring week of the year so far? It was very gloomy and dark outside (+ pretty cold!) and it made me feel tired the whole week. I spent most of my days working and falling on sleep on the couch in the evenings. Some small highlights? 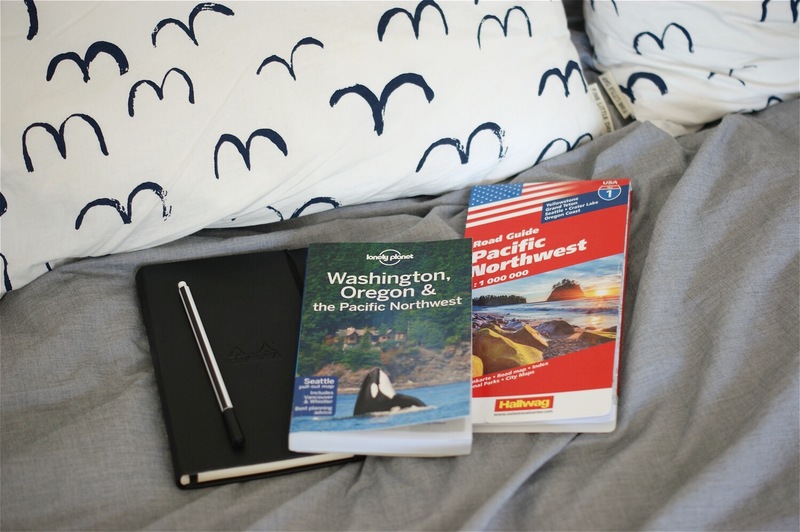 We’ve started planning our trip which is already next month. We go to Canada and the United States for almost 4 weeks. We first fly out to Toronto to spend a week with my brother in law and his wife. After a week we fly out to Portland, Oregon where we will spend two days exploring the city. After that we’ll go on a road trip/camping trip through Oregon which is like a dream coming true. There are so many things we want to see that it was pretty rough to start planning. However, I think we nailed it down to some of the most amazing places. So exciting! I will tell you more about our trip soon. It’s crazy how long watering the plants takes these days. 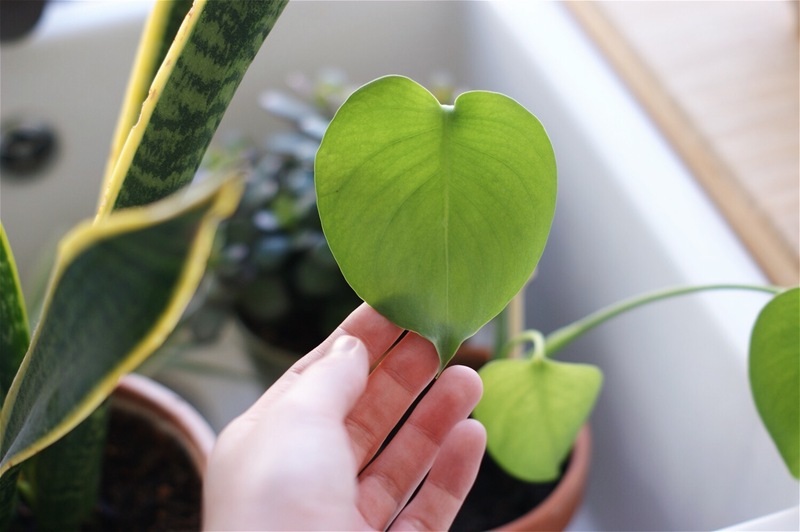 We bought so many new plants in the last few months and they all grow pretty fast so we have several cuttings as well (like this cute monstera cutting). I love watering them in the morning and it feels so good to see them grow, really therapeutic! 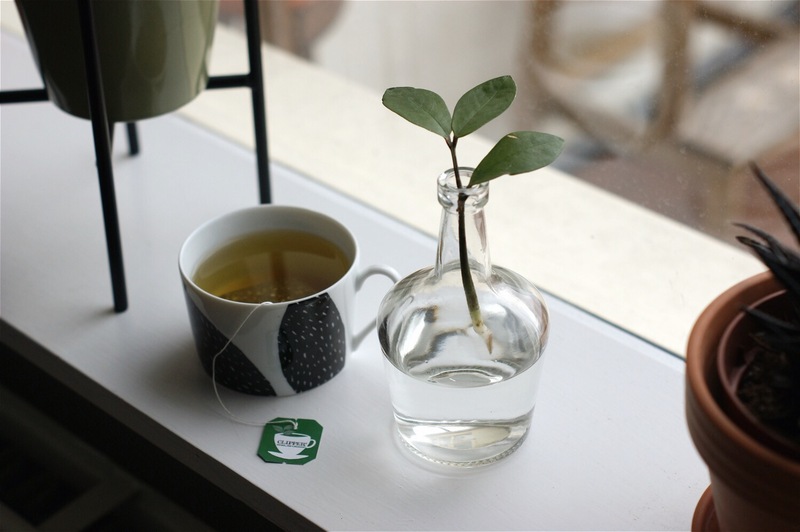 I can’t imagine a life without plants anymore. 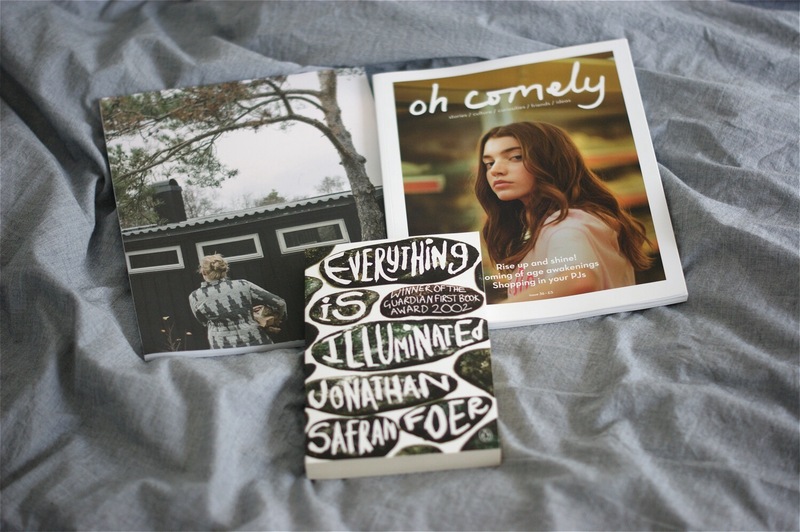 On Saturday I finished reading ‘Everything Is Illuminating’ by Jonathan Safran Foer and started reading ‘Americanah’ by Chimamanda Ngozi Adichie. On Saturday evening we took the train north and slept at my parents in law. We went sailing together on Sunday which was pretty nice as we got to relax, enjoy some sunshine and lots of good food (too bad I forget to bring the big camera). Week 17: the weather was a little disappointing this week. The weather is constantly changing and deceiving us, one moment the sun is out and there are bright blue skies and then some moments later a hailstorm is upon us. Around three weeks ago we started planting all kinds of different seeds. As it was still freezing at night we decided to let them grow inside. 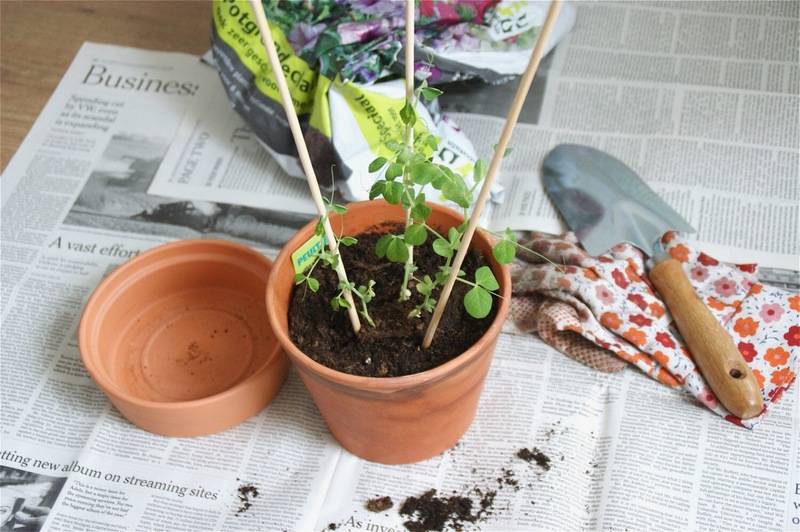 One of the seeds we planted was a garden pea and it has been growing so fast! This week we repotted it and put some sticks in the ground to guide it. Really looking forward to see it growing in the next couple of weeks. On Saturday my parents came to stay over, as they don’t live very close they come to spend a whole weekend with us every now and then. My parents are always bringing gifts with them when they come to visit and this time my mom had bought me a beautiful bouquet of flowers. After several cups of coffee, we went for a city walk together and ended up getting some Japanese take out for dinner. On Sunday morning the sun was out again and it felt a little warmer than it was on Saturday. 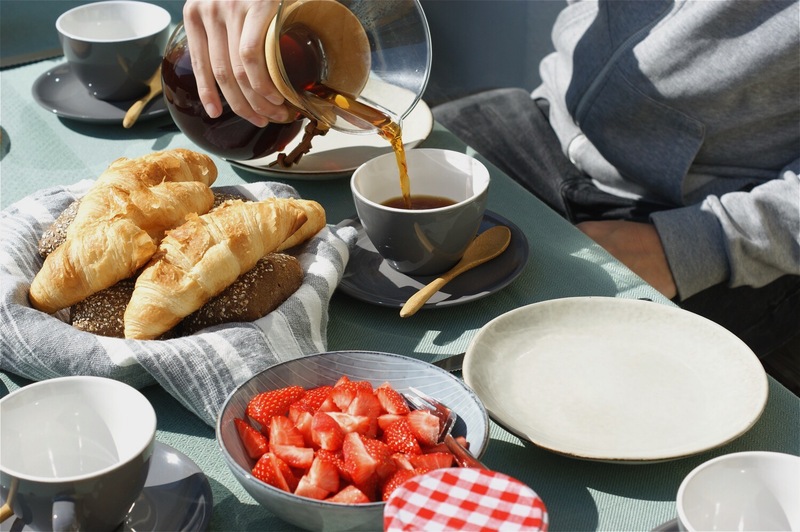 We decided to enjoy the sunshine as much as we could and had breakfast outside on the rooftop terrace. After a long and good breakfast we went for a walk in the forest. It was really nice to spend some time together and to enjoy the weather. I’m hoping for some nice and sunny weather in May, especially since it’s one of my favourite months of the year. Really looking forward to have picknicks in the park and to go for long bike rides after dinner (without having to wrap yourself in warm clothes!). 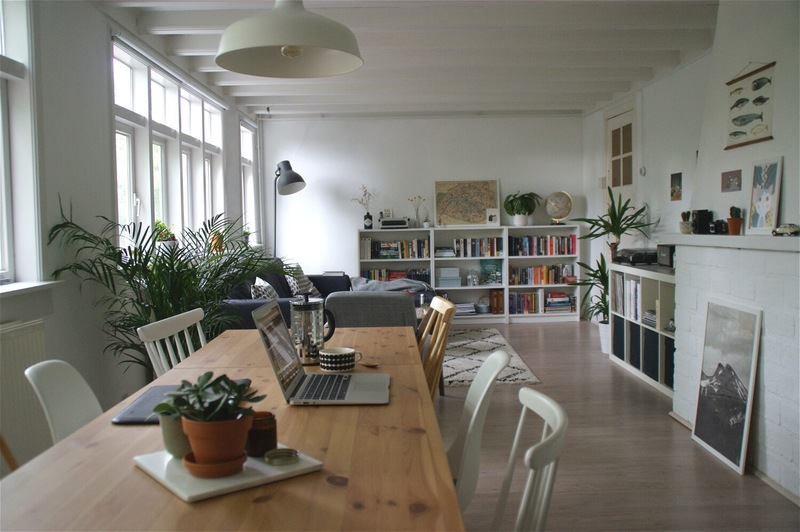 Week 16: I live in a rented apartment and I’m totally fine with that. Our apartment is old and not at all perfect but I love our space. It’s light, quite big with two bedrooms, a big rectangle of a living room and a separate kitchen. The kitchen is nothing special and there isn’t much space in it. We hung up some kitchen shelves as soon as we moved in here to have more space for our coffee makers and cups. 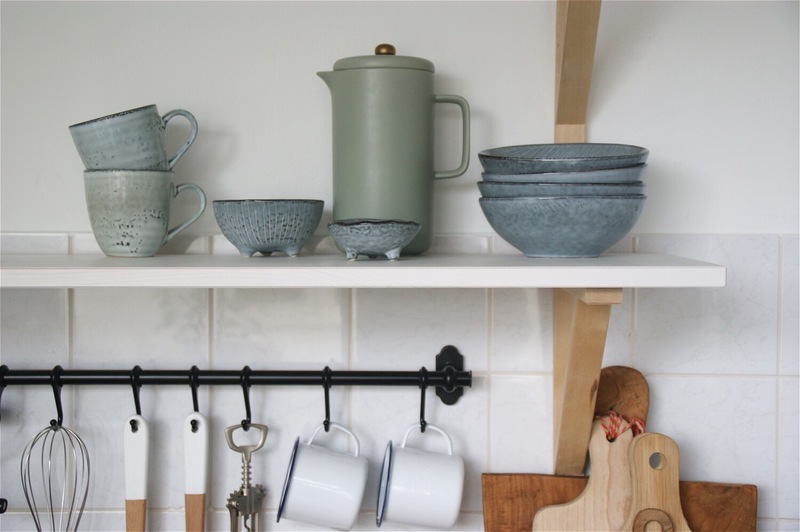 These shelves quickly became one of my favourite things in the kitchen. I love how I can display some of favourite cups, bowls and pretty coffee makers on it. I love to change everything around every now and then to keep things interesting. 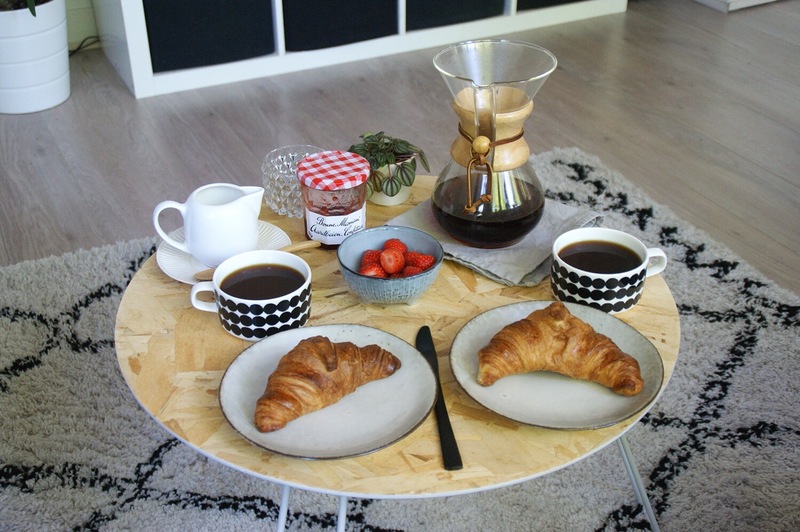 This is the current set up with tableware from Broste Copenhagen and House Doctor. I love how the items have slightly different tones of blue/green but are still matching and very similar. I got a little cutting as a gift from a friend when she came to visit. Such a great gift! Can’t wait for it to grow some roots. On Sunday I decided I wanted to read for a couple of hours without any distractions. I recently became very aware of the fact that I’m so easily distracted. 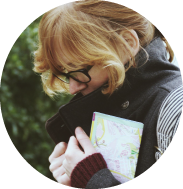 I sort of constantly feel the urge to check up on Instagram, blogs, Pinterest and so on. I love the visual aspects of everything on the internet and it gives me a lot of inspiration as a graphic designer and illustrator. However, putting away all the digital stuff a little more often would be good for me. 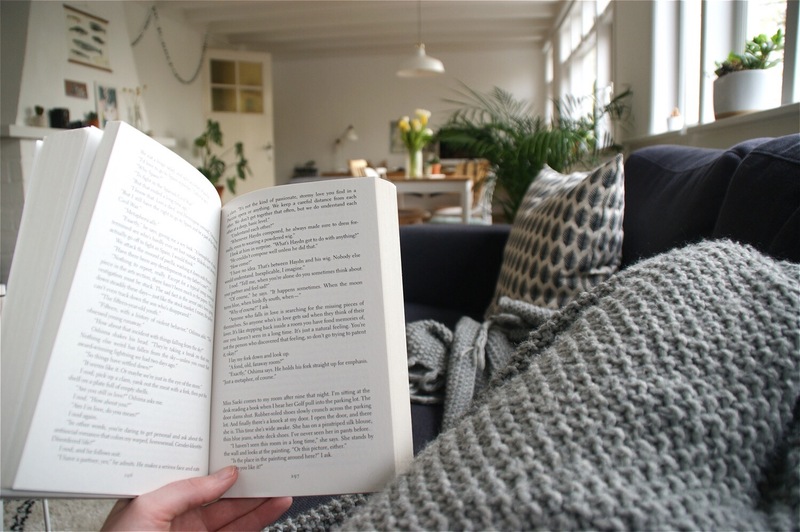 I always have loved reading and I can read almost anywhere, even in loud and lively spaces. I wish though that I would read a little more instead of checking Instagram for the 100th time on a day. I finally read more than a 100 pages at once, without any disturbances at all. It felt so good! Must do this more often, especially in the weekend. Week 15: we did a lot of preparation for Easter this week. We bought yellow tulips and lots of fruits like these beautiful little figs. 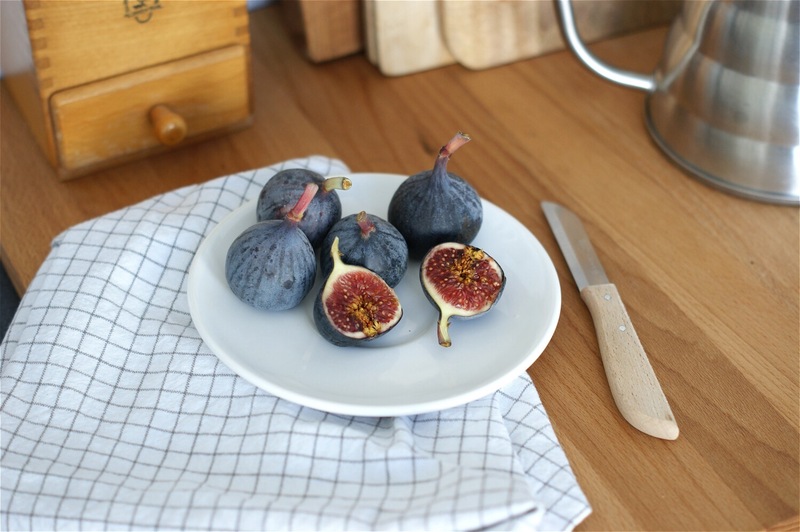 I always love to put some fresh figs on top of my bowl of yoghurt and granola and these were just so ripe and sweet. We looked forward to the long Easter weekend for the whole week. 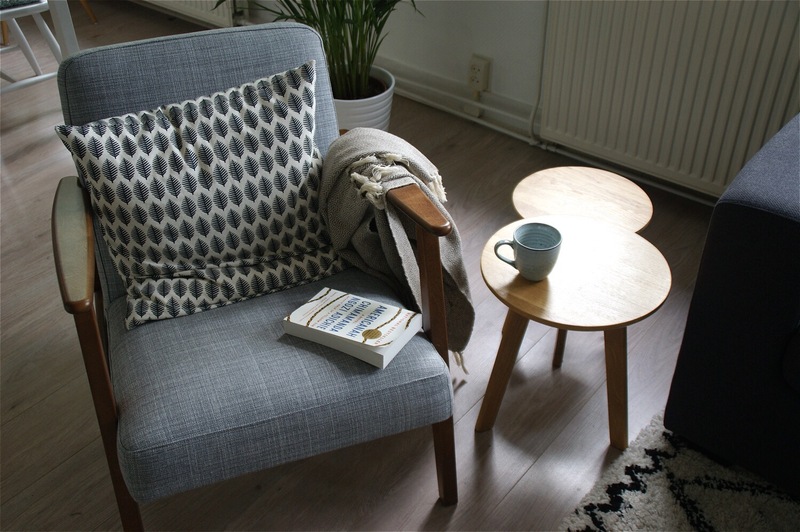 Since we have been so busy for the last couple of weeks, we both longed for a weekend in which we could just sit back and relax. And that is just what we did. 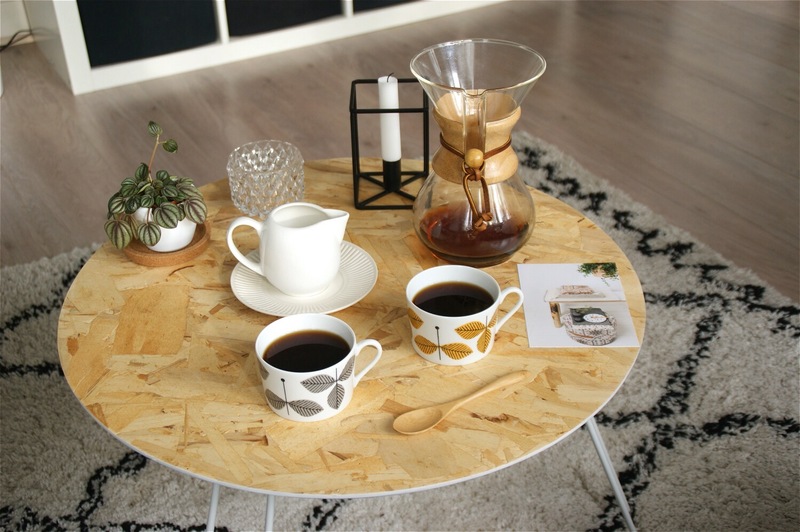 We drank coffee and tea (from my beautiful new collection of House of Rym cups) while we talked a lot, watched Netflix and Rene played video games while I spent my time reading on the couch. We both already felt energised again before it was Monday again (we both were free on Monday and Tuesday this week as well!). Week 14: on Wednesday my new Macbook Air that I ordered came in. I have been wanting one for quite a while so I was overly excited (besides all the installing that is). As some of you know, I work as a freelance illustrator and graphic designer so I work from home a lot. We have a big desk set up in our living room from where I usually work on my iMac. For the last couple of months I sometimes got frustrated with working from home. As it may sound perfect, and it mostly really is, it also has some big downsides to it. You can get lonely sometimes as you always work alone and are not able to socialize with colleagues and most of my client contact is done digitally. Also working from home means a lot of distractions, for example I can’t stand it if it’s a mess around the house as it really distracts me from my work. When that’s the case I start to clean the house or run some errands instead of working. So I thought it would be a great solution to be able to work at other places or with friends every now and then. Last week I decided to go for it and bought this Macbook Air and I love the freedom it gives me! It even boosted my productiveness as I’m now also able to work from the couch or from bed in the evenings, when I’m usually tired and don’t want to sit at my desk anymore. Double win! 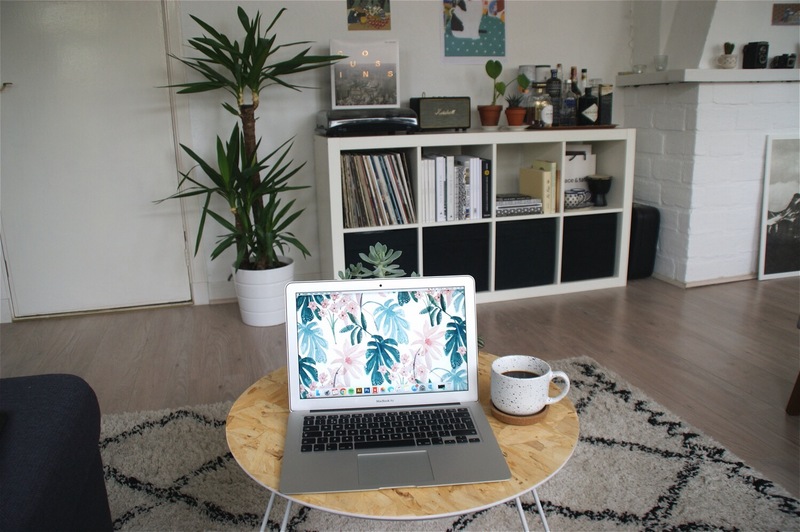 The pretty wallpaper is by Chloe Hall for DesignLoveFest. 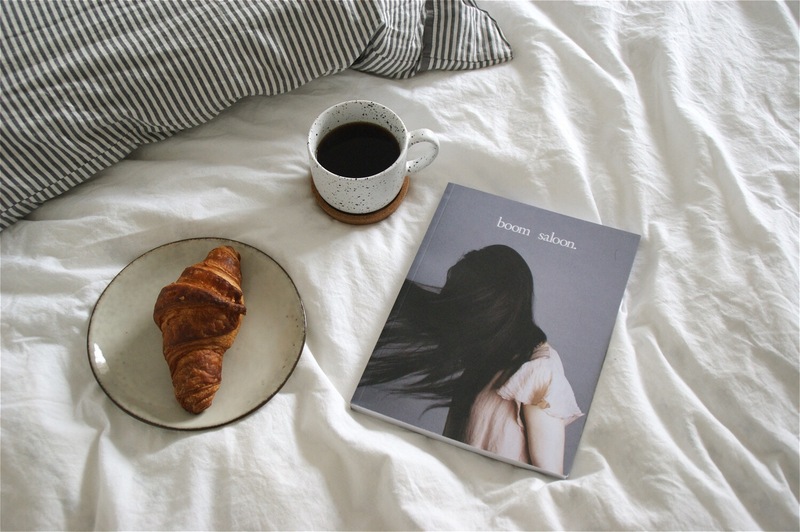 On Saturday morning I took it slow and enjoyed a croissant and coffee in bed with the first edition of Boom Saloon. On Sunday it felt like it was Summer, the day started out quite warm and we enjoyed the Sun on our rooftop terrace. In the afternoon we went for a long walk in the forest where Rene took this photo of me. We’re so lucky with the lovely weather lately. I try to soak up as much of it as I can because I know it won’t last- after all this is the Netherlands. 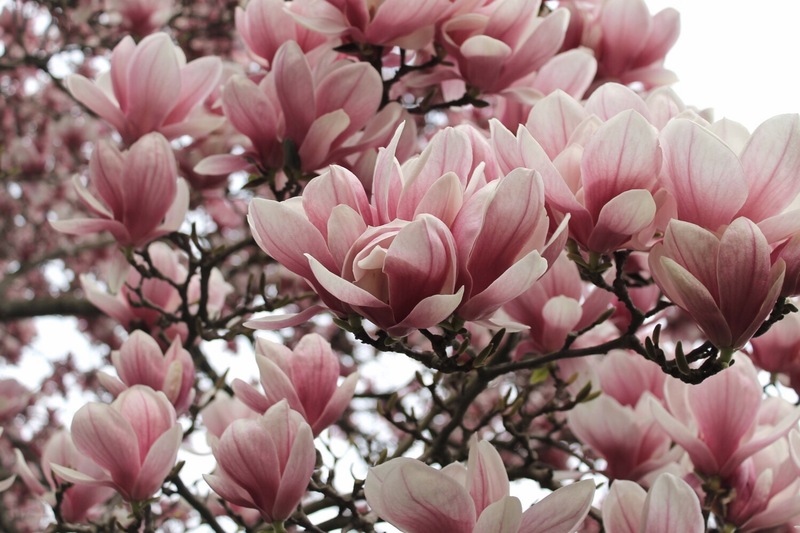 Week 13: all the magnolia’s in our neighbourhood starting blooming and they just look so pretty, don’t you think? I came across so many on my daily walks but this one was by far the prettiest. 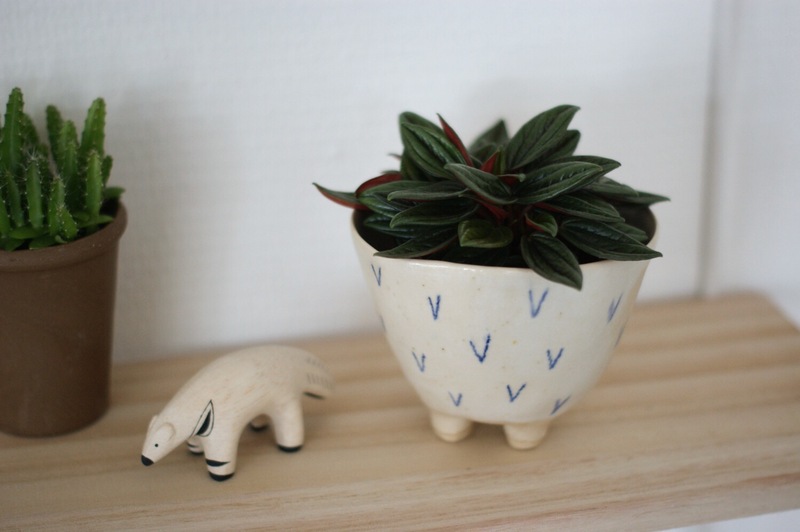 I found the perfect little plant for the ceramic planter from HearHear and I love that handmade wooden ant eater from T-lab (now I want to collect them all). On Saturday we hired a car and went to Ikea and the garden center. As the weather gets nicer we wanted to give our rooftop terrace a little make over. We traded our (ugly) old metal chairs for some wooden lounge elements from Ikea and we’re very happy with it, such an improvement! We want to get two more elements soon so that we have a complete set for this Summer. We also bought a garden bench that we wanted to use to create a little garden in front of the kitchen window. I never thought plants would me make this happy. Week 12: this week I did some major shopping. I always buy a new pair of sneakers when Spring starts and this year my eye fell on this beautiful olive green Nike Internationalists. They walk heavenly! It’s like I’m running on my running shoes all day long, except these look a little more urban. 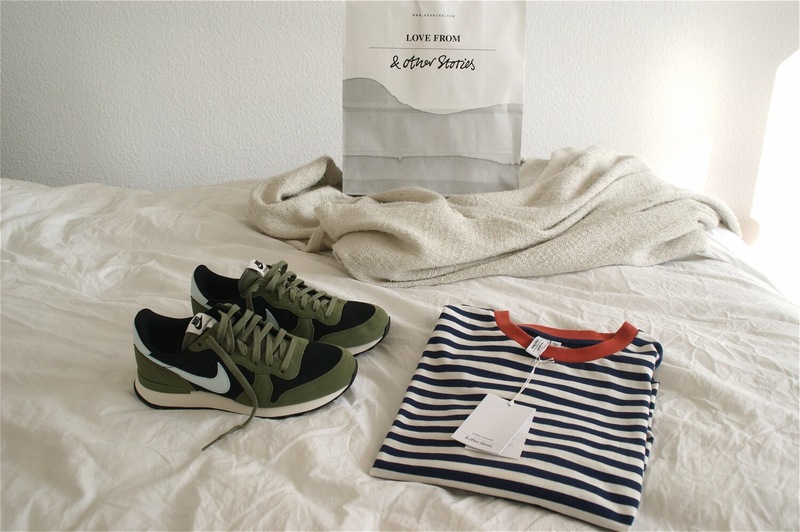 I bought them at & Other Stories in Amsterdam and couldn’t resist to buy yet another striped shirt. 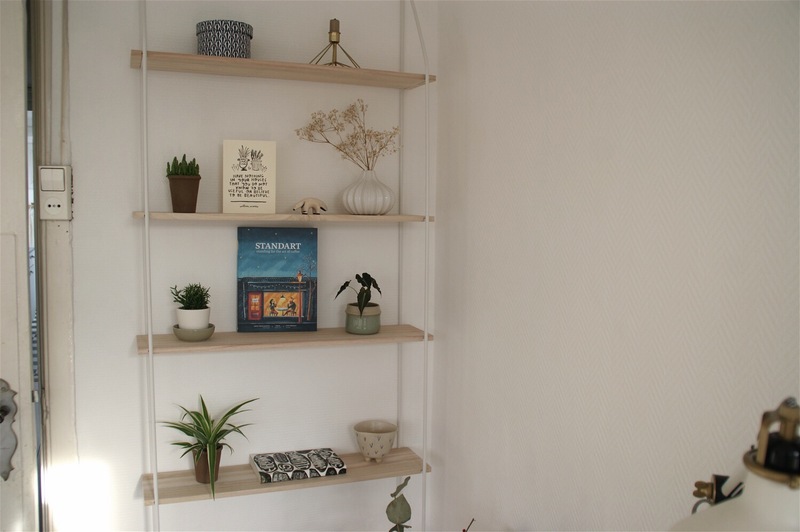 At Søstrene Grene Rene and I fell in love with this shelving system which is perfect to highlight some pretty items (like the handmade ceramic pot on little legs from HearHear. Still have to look for a cute little plant that fits in it). 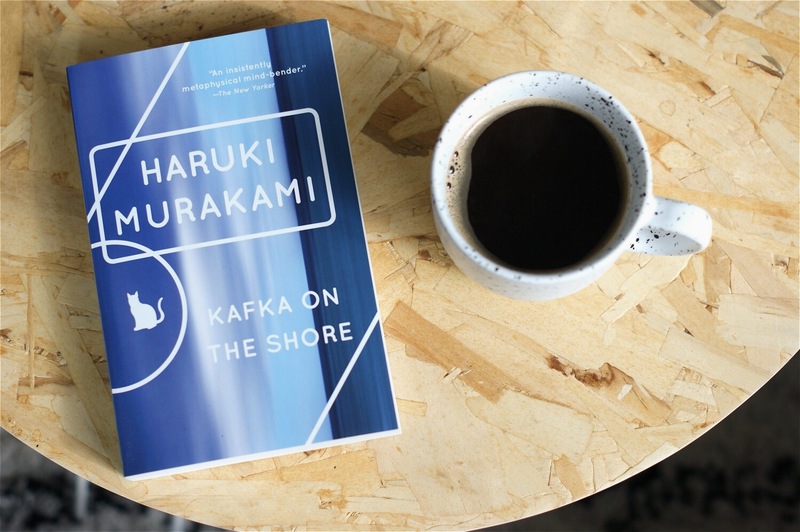 Last but not least I bought two new speckled cups and a Murakami book, which I hope will be just as good as ‘The Wind-Up Bird Chronicle’ and ‘Norwegian Wood’ that I read earlier from him. Week 11: the beautiful Spring weather continued, with a peak temperature of 15 degrees Celcius on Thursday! 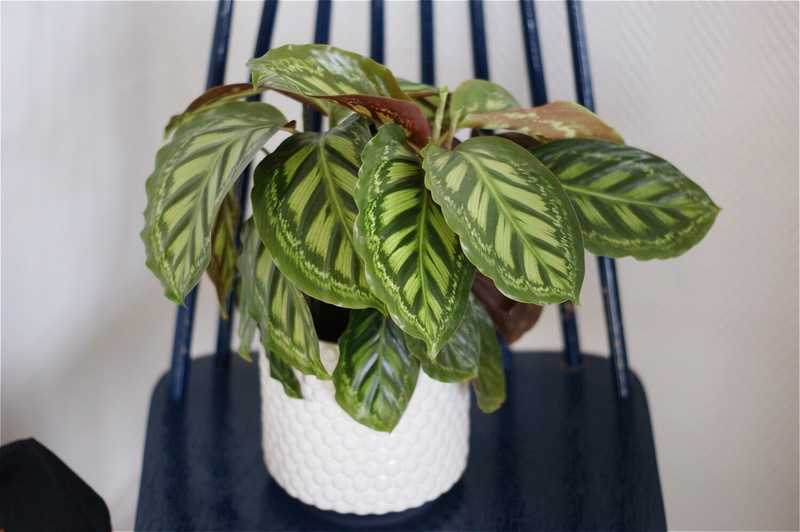 My new Calathea doesn’t enjoy the Sun at all though so I had to move it to a new place as the leaves burn very easily when they got hit by sunlight. 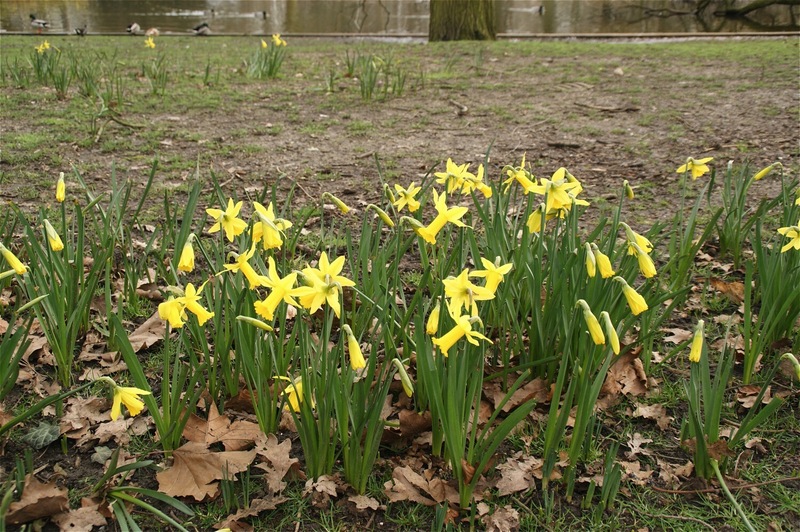 I love how everything started to bloom with the higher temperatures, like all these pretty daffodils in the park. On Wednesday it was Election Day in the Netherlands and it made me extremely happy to see how many young people went voting. The results could’ve been a little better but overall it went pretty ok. Now we have to wait and see what good will come of the new government. It was pouring rain the whole weekend so we stayed mostly inside and took it slow. 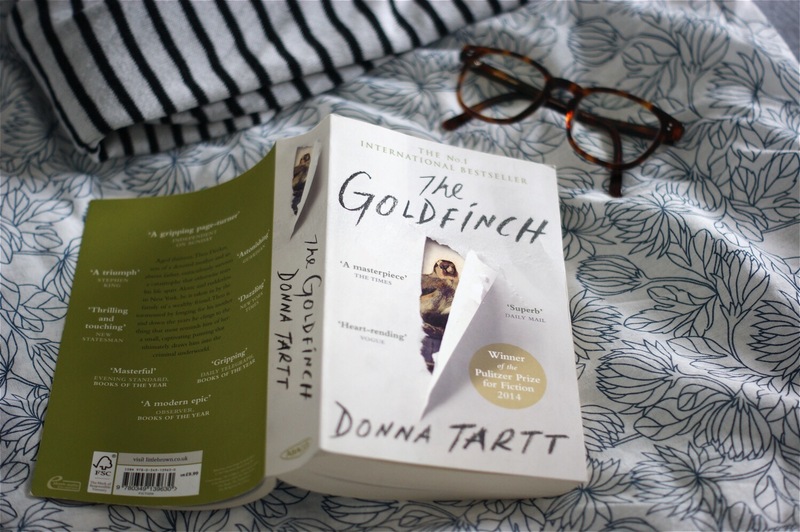 I finished reading ‘the Goldfinch’ and I absolutely loved it! Definitely recommend it if you haven’t read it yet. Week #10: Spring arrived with lots of sunshine and higher temperatures. I’ve had a lot of work to finish during the week so I really wanted to spend most of my time outside in the weekend. On Saturday morning Rene and I took the train to Amsterdam to have coffee and cake. We ended up going to Bar Botanique, which feels like you’re entering a tropical paradise with a lot of green and pink mixed together. 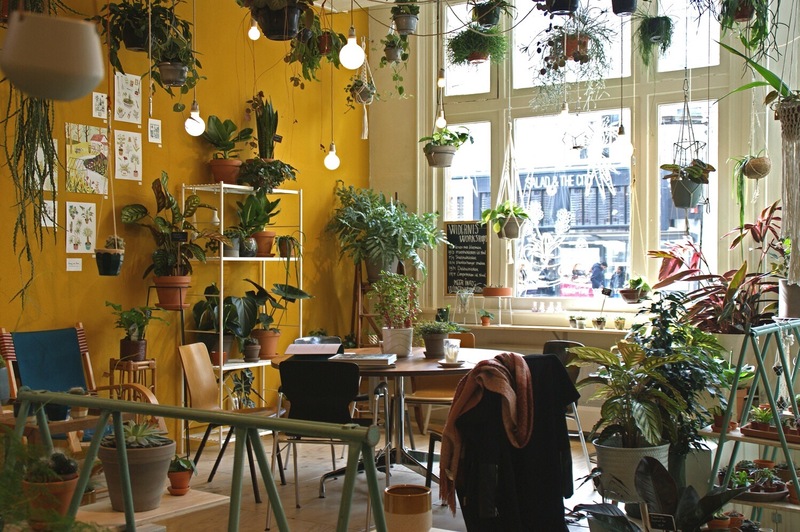 The space is filled with vintage furniture and plants which also gives you the feeling like you’ve just stepped into a very big and cozy living room. 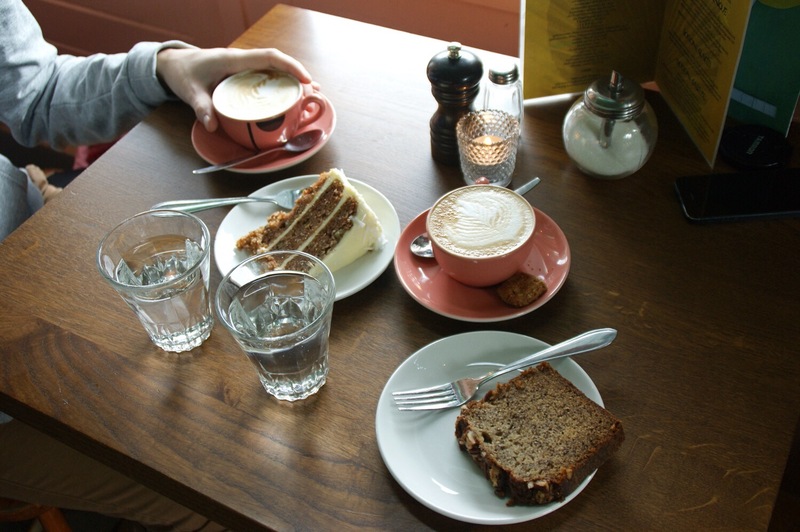 Their coffee was good (served in these pretty pink cups) and the banana bread and carrot cake (3 layers!) quite yummy. 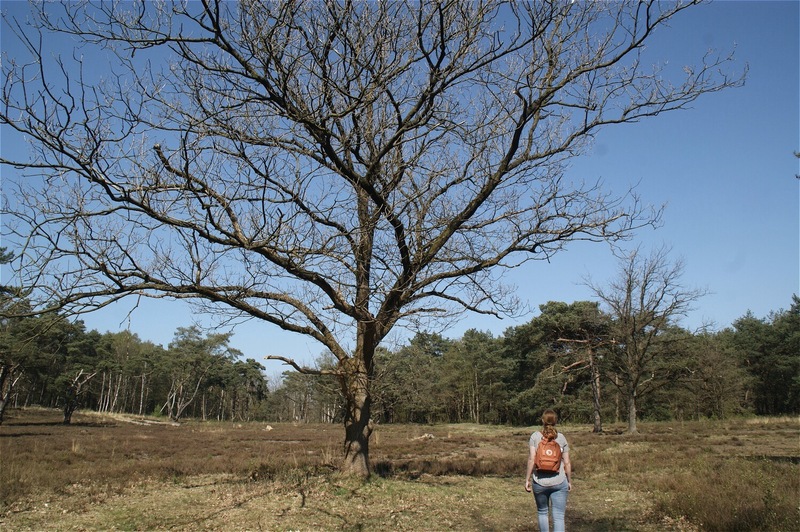 After coffee and cake we walked through the East of Amsterdam all the way to West. 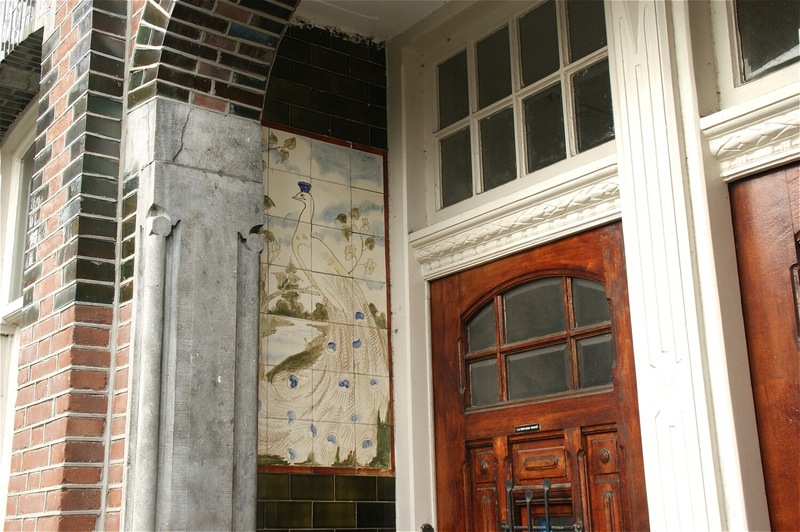 I always love to look at the details of old houses and spotted these pretty peacock tiles in ‘De Pijp’. We visited Wildernis that done a restyle of their shop recently. They painted one of their walls with yellow ochre among some other things. We ended up buying two new plants, a calathea and a little elephant’s ear (alocasia amazonica). 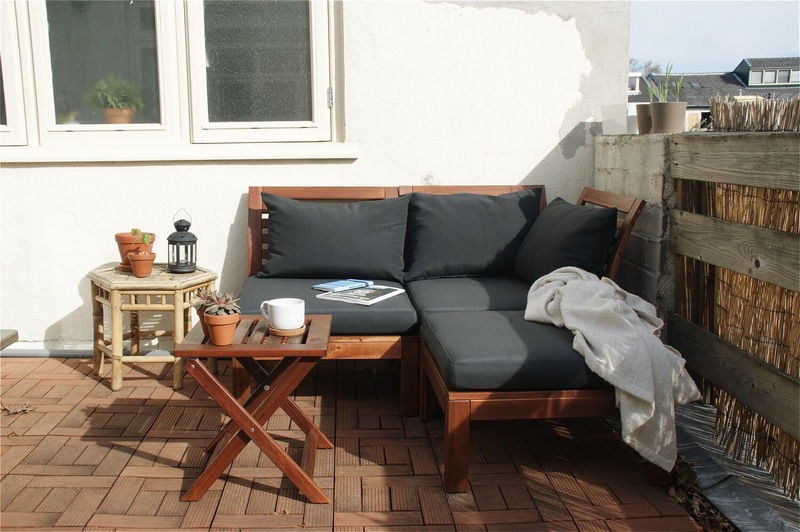 On Sunday we started cleaning our rooftop terrace to make it ready for Spring and drank our tea outside in the sun. Saturday was as you can see the most fun day of the week and it’s funny how just one day can recharge you in such a big way.